This is an extremely rare Rosewood Victorian size sofa, made by John Henry Belter for Tom Thumb. 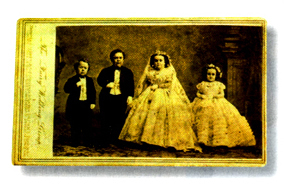 On February 10, 1863, Lavinia Warren(1841-1919), "The Little Queen of Beauty" married Charles StrattonCharles Stratton (1838-1883) "General Tom Thumb" at Grace Chruch in New York City. The wedding was the social event of the season with over 2,000 guests attending the reception at the Metropolitan Hotel and for a moment pushed the Civil War off the front cover of Harper's Weekly. Wedding gifts came from not only the captians of American industry, but also the crowned heads of Europe. Newspaper articles chronicled the jewelry, silver, china and furniture that were given as gifts. In October 2009, Howard Tibbals donated to the Ringling Museum a sofa that was once owned by Tom Thumb and his wife Lavinia and thought to be a wedding gift. 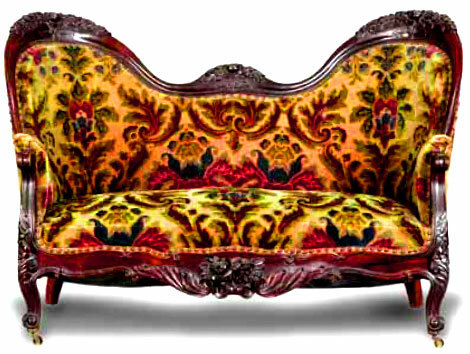 The rosewood sofa, with its original colorful silk damask velvet was designed in the Rococo Attributed to Alexander Roux, Buffet owned by Mr & Mrs Tom Thumb (Charles Stratton) c. 1860, Gift of Ken & Carrie Cox, 2006.Revival style, which was popular in America in 1863. The sofa with the beautifully carved floral crests is the work of John Henry Belter (1804-1863), the premier furniture maker of the mid 19th century. The dimunitive sofa came with family records that documented its history. While going through the family documentation, it was determined that a rosewood Rococo Revival style buffet that was given to the museum in 2005 by the Coxes, was the companion piece that had also been sold earlier by the family. Now re-united together here at the Museum, the two furniture pieces are rare additions to their collection.